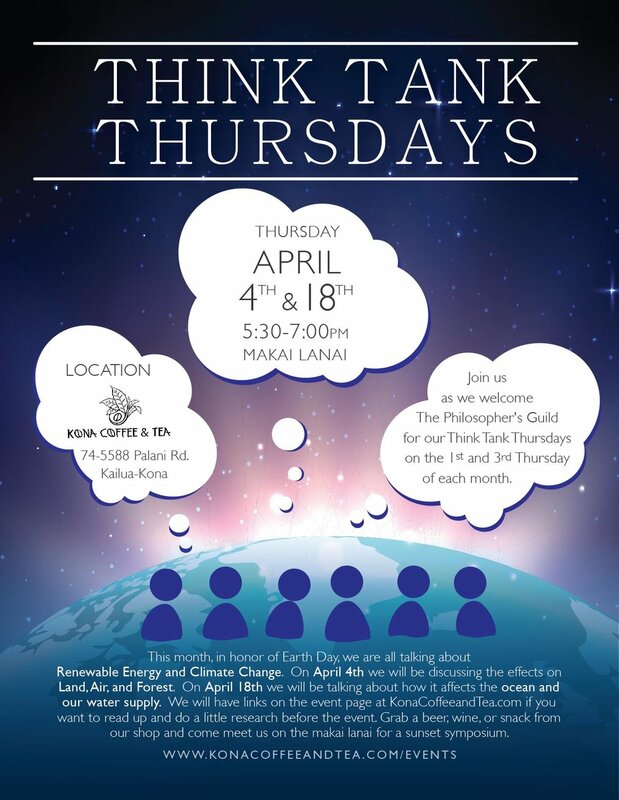 Join us as we welcome The Philosopher's Guild for our Think Tank Thursdays on the first and third Thursday of each month. This is a popcorn style community talk story where everyone gets to participate in the conversation, or if you’re more comfortable you can sit back and listen to all the interesting information that is shared. This month in honor of Earth Day we are all talking about Renewable Energy and Climate Change. On April 4th we will be discussing the effects on Land, Air, and Forest. On April 18th we will be talking about how it affects the ocean and our water supply. Grab a beer, wine, or snack from our shop and come meet us on the makai lanai for a sunset symposium.